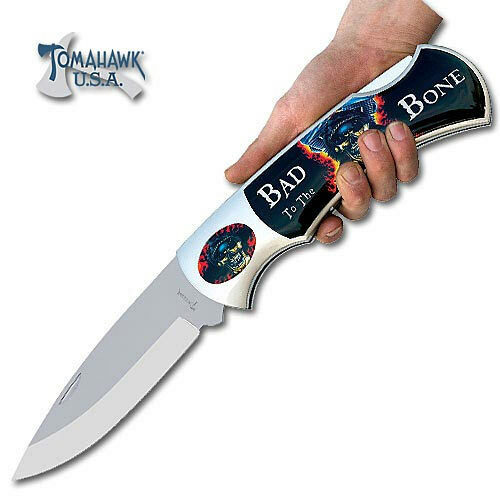 Bad to the Bone Monster Folding Knife | BUDK.com - Knives & Swords At The Lowest Prices! This massive collectible folding knife is sure to grab everyone&apos;s attention! This folder features a 7 1/2" stainless steel lock back blade in a composite handle accented with the "Bad to the Bone" design. hi guys good afternoon i just recieved my bad to the bone monster folding knife and let's say it's a monster folder. looking at the smaller pocket knives i here. let's just say it makes the others almost look tiny in comparsion, heck i was really impressed by it, and holy smokes is all i can say after opening the box for the very 1st time. seen 2 more folding knives i want to add to my collection and it's 1 cool collector's piece. have a merry christmas and god bless. thank you david bihm. This piece is definitely "BAD TO THE BONES" . Being Crafted out of SURGICAL STEEL, makes it hold an edge, INDEFINITELY !!! I intend to purchase every one I can get my Hands on, before they're OUTLAWED !!!!!!! The handle is very flimsy plastic. My suggestion would be to make the handle out of a cheap stained wood & still be able to keep the price down. I give it a two star because the blade is acceptable & the initial shock of the size. When the knife arrived I was surprised how big it really was. While the knife looks really impressive, it is definitely designed only to be looked at. While the blade is made of metal everything else is made with cheap plastic. While opening I was afraid it would break because the plastic was so cheap. But I should have know for $15 not to expect much.